The thing that I find most amusing about the superstitions that surround anything remotely nautical is how most of them are utterly ridiculous. I think the humans of times gone by dreamt things up to make themselves feel like they had some sort of power or a way of determining their fate. In the past, sailors were faced with long passages with only limited means of communication and very basic navigational equipment. Lots of mariners believe that it’s bad luck to leave port on a Friday, especially Friday the 13th! I think this is mainly due to the belief that the crucifixion took place on a Friday. My dad was born on Friday the 13th so it’s actually a lucky day for us aboard Nocturne. We set sail when the humans have time off work and the weather is good. We don’t consider the day of the week and so far, paws crossed, have never had a problem. Like lots of other things, it’s considered bad luck to change the name of a boat. According to legend, every vessel is recorded by name and is known personally to Neptune, the god of the sea. If you do rename a boat it’s believed you must have a de-naming ceremony. 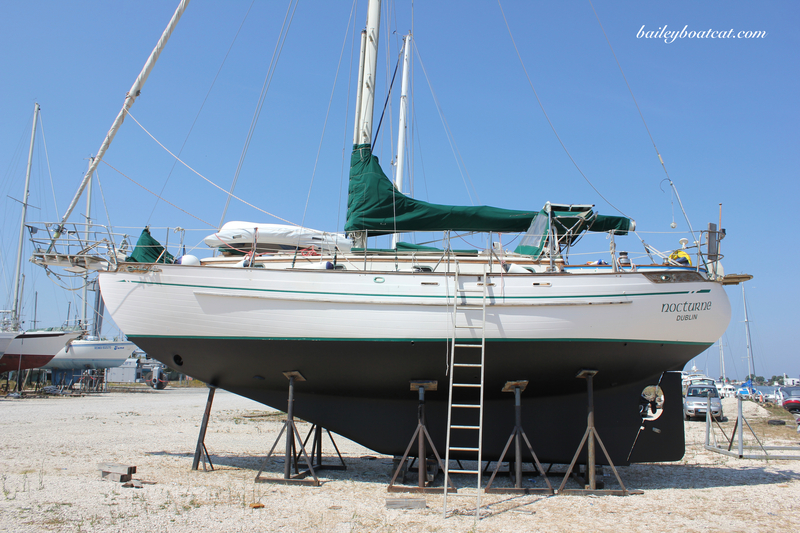 All traces of the old boat name must be stripped from the boat and then the ceremony can be performed. It’s a fairly simple ceremony conducted by writing the current boat name on a piece of paper, folding the paper and placing it in a wooden box which you should then burn. The ashes have to be gathered and thrown into the sea. To rename the boat you should have plenty of champagne (or a good bottle of rum) to pour over the bow of the boat whilst asking Neptune to bless the boat and all who sail aboard her. Crew and guests should also drink some of the offering. Purrsonally I think this is just a way for humans to legitimise drinking, it’s well known that most yachties enjoy a drink or two! 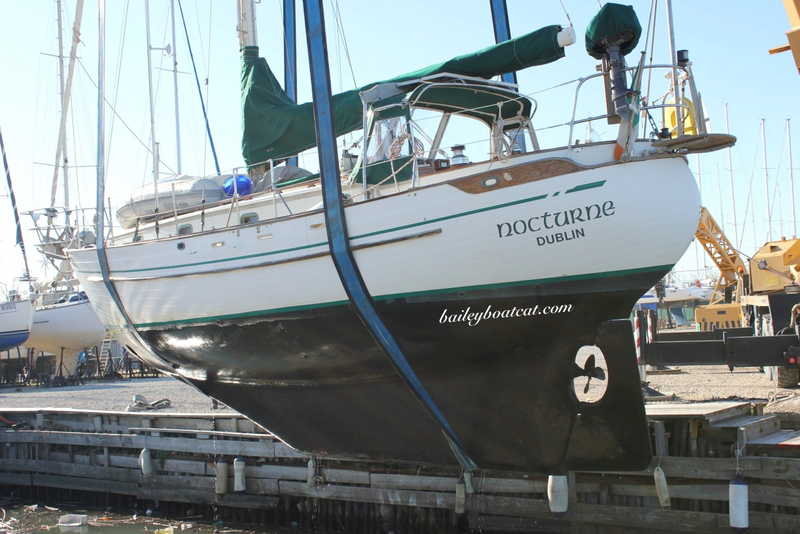 Nocturne has been renamed, she was previously known as ‘Encore’ but the previous owners decided to rename her. I’m not sure of the details as to whether they followed the ceremony correctly, but I did spot a binder with the name ‘Encore’ on it buried in a cubby! Nothing bad has happened to us as a result in the four years we’ve been sailing her! We love the name ‘Nocturne’ and are happy with it, but if one day we happen to have a boat with a dreadful name I wouldn’t hesitate to change it. Well, as long as I get a bowl of cat milk and some smoked salmon of course! One of the funniest superstitions, in my opinion, is that it’s bad luck to have women on boats! Some salty sailors thought that women aboard would anger the seas. However, it was also said that a naked women would calm the sea, this is why many older boats have a figurehead with a bare-breasted women with her eyes open to help them find their way through the seas. Now I’m no human, but this really sounds like a man made this superstition up for some peace and quiet or some cheap thrills! We have a women aboard 99% of the time and she mostly wears clothes. So far I’ve not noticed any difference with the seas whether she’s there or not! 1. 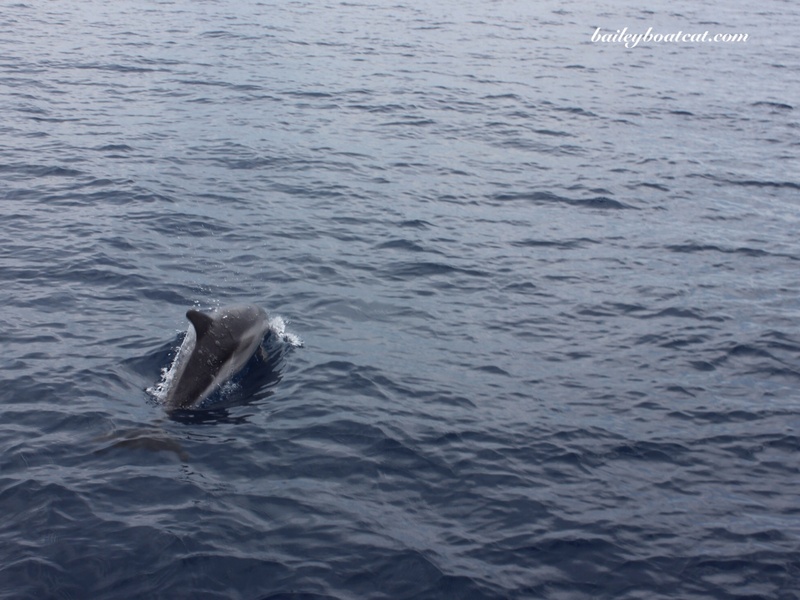 It’s believed dolphins swimming along playfully with a boat are a sign of good luck. 2. However, if a shark is seen following the boat it could be a sign of impending death! The most sensible superstitions are based on feline facts. Cats have been aboard ships from the very first boat launch. It’s true that we can sense a change in the weather. Sailors have long watched our behaviour in order to predict the weather. If a cat licks its fur against the grain, it means a hailstorm is coming, if we sneeze it means rain and if we’re seemingly frisky it means wind. 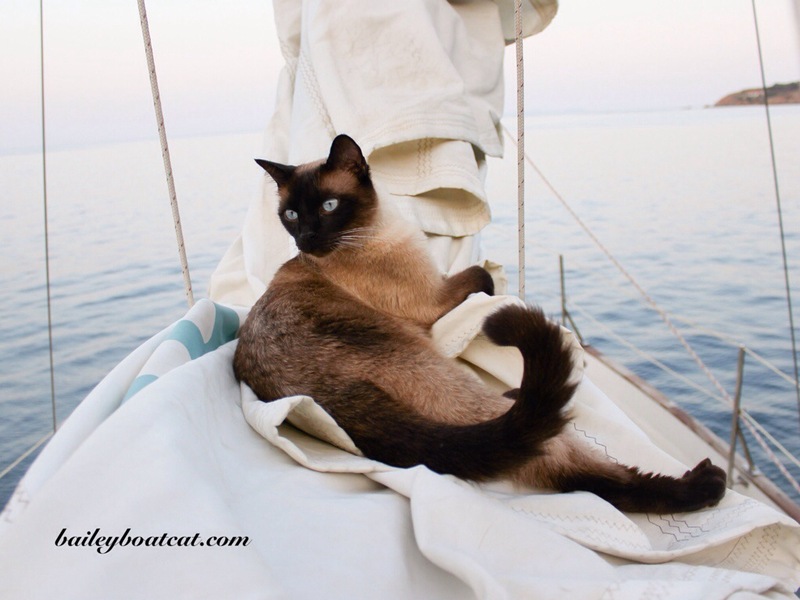 In ancient times some sailors believed that cats could incite storms with the magic stored in our tails… I couldn’t possibly tell you if this is true or not, but my humans should always make sure I’m comfortable and happy just in case! LOOK Insurance have recently launched a sailing superstitions survey of their own, in an attempt to unearth all the pawesome superstitions out there! So if you abide by any sailing superstitions yourself, then head over to LOOK Insurance and share yours with them today. It will only take you a minute to answer four quick questions and make them purr. Whilst I researched if I’m still designated nine lives at sea I found out that if a ship’s cat falls in or is thrown overboard and not rescued, we are capable of summoning a terrible storm to sink the ship. If the ship’s able to survive through some sort of miracle, it will be cursed with nine years of bad luck! So thanks to the reference of nine, I’m fairly confident my feline privileges are intact. I feel very lucky to be living my dream and I’ve still got eight lives left and counting! Yes John, and she’s well overdue again! We’re trying to figure out when to haul her out and do a little work too. She has a large draft! I grew up on a large lake in Michigan and am familiar with pleasure boating and sailing small sailboats, nothing your Nocturne! I too was born on a Friday the 13th! Very interesting, thanks for sharing all of that! What an interesting post, Bailey. Thanks for all the info. Humans and their superstitions are amusing. Wow that’s so funny Speedy! I never knew that! Maybe it’s only unlucky if you plan to EAT the bunnies. We had a bunny on our boat when I was a kid, and she never brought us bad luck (just some strange looks from passers by who saw her scampering around the deck). Our CAT thought she was unlucky though, because our bunny would try to bite the cat if she came near. And to think, we were worried about the cat hurting the bunny! No, that bunny could fend for itself! really interesting post, I didn’t know about those superstitions. I’m sure that you will have the rest of your nine lives and hope you have a wonderful time in all of them. These are fascinating, Bailey! I especially like the idea of us kitties having magic in our tails! I know Sparkle! Pawesome huh?! Bailey, if you’re finished with that foresail, and haven’t sharpened your claws on it, ship it to me… will you? I need a new one this year. Bailey, No wonder you have such excellent sealegs! How lucky that your present humans rescued you from a “skyscraper” existence! I know Pat! When my mum took me home to Nice we also lived on the fourth floor and I wasn’t allowed on the balcony unless I was wearing my lead. I much prefer the boat, it’s a much softer landing if I fall! I don’t know why but I want to respond to nearly everything about this! (Loved this post by the way–so much of it I didn’t know, or just vaguely remembered from my childhood on a boat). 2. Our boat was names SNAFU, which my parents always told me was “Situation Normal All Fowled Up.” My mom never changed it, but it wasn’t supersition–it was the cost to change and have it registered! 3. HAHAHAHA. 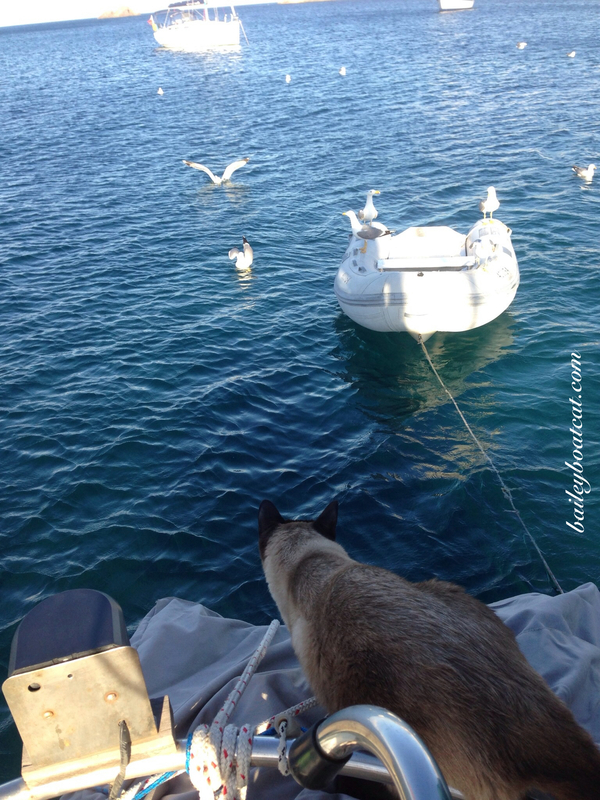 Yeah Bailey…on our boat, women outnumbered the men (even counting our cats, bunnies, and mice). No crashes! In fact I’m pretty sure my mom helped us NOT crash a few times. Loved the feline superstitions…I never new any of those! But not surprised that cats have been on ships since ancient times…they are great company. PS…love the celtic lettering on Nocturn! These are fascinating superstitions, B. I think my favorite is that your tail is magical. Of course it is!! I am not a bit surprised by that! I was born on a Friday the 13th too and it’s always brought me good luck ! We are definitely part of the no bananas on the boat club. One thing, I always have had a good, peaceful or calm Friday 13th so I look forward to it as a day I feel blessed.